Clean, dry, and fresh during the day. 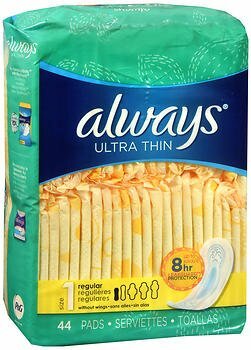 Up to 8 hours absorbency for your busiest days. Moves with you to help give you worry free moments. Absorbs 60% faster (vs. the leading store brand Ultra Thin pad of comparable size). View More In Women's Health. If you have any questions about this product by Always, contact us by completing and submitting the form below. If you are looking for a specif part number, please include it with your message.